Today’s entry is written by Sarah Moazeni, a Graduate Reference Assistant working in the Tamiment Library and Wagner Labor Archives. On May 1 1886, thousands of workers across America demonstrated and organized strikes to force employers to agree to an eight hour work day. Workers gathered in Haymarket Square in Chicago that week and though the demonstration was peaceful, someone in the crowd detonated a bomb that killed several police officers and bystanders. The subsequent trial of eight accused anarchist conspirators helped galvanize the labor movement, contributing to the establishment of May 1st as an international day of labor. 1890 marked the first official international labor demonstration that became May Day. Over time, May Day became a day for left groups and working classes to hold parades, political demonstrations, and take the day off from work to celebrate the labor movement. The period from the 1940’s through the 1960’s was one of sweeping political and social change, global contests of power and influence, and negotiations between left political movements and the working classes. These images from the Tamiment’s collection of photography from the National Guardian, a radical leftist weekly newspaper published in New York City, document these trends through moments on May 1st around the world. Follow along with this map! 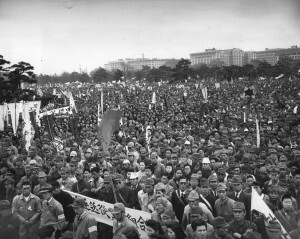 Crowd at May Day Demonstration in Moscow; May 1, 1959; National Guardian Photographs; PHOTOS 213; Box 4; Folder 47; Tamiment Library/Robert F. Wagner Labor Archives, New York University. Though May Day was celebrated illegally in Russia prior to 1917, it was celebrated as a state holiday under the Soviet Government after the Russian Revolution. As these photos from 1959 and 1960 show, the largest celebration was held in the Red Square with political leaders watching from Lenin’s mausoleum. These photos are from the period of Khrushchev’s premiership, a time of the Space Race and shifting relations with the United States. 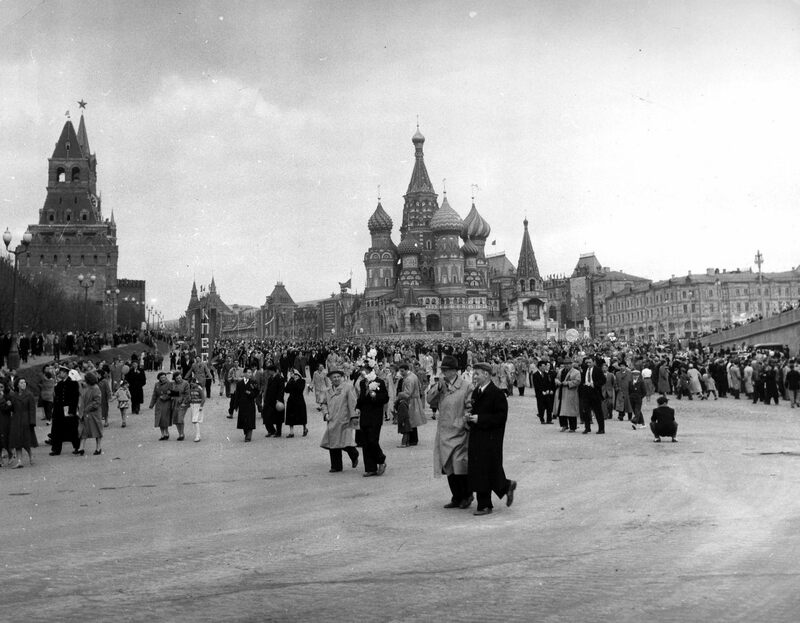 After the May Day Parade in the Red Square, Moscow; May 1, 1960; National Guardian Photographs; PHOTOS 213; Box 4; Folder 47; Tamiment Library/Robert F. Wagner Labor Archives, New York University. 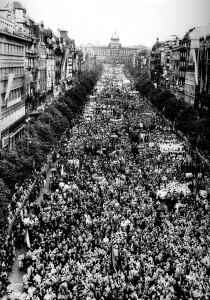 May Day in Prague, Czechoslovakia; May 1, 1959; National Guardian Photographs; PHOTOS 213; Box 4; Folder 47; Tamiment Library/Robert F. Wagner Labor Archives, New York University. Svátek práce, or May Day, was celebrated in Czechoslovakia during the Cold War and persists to this day. 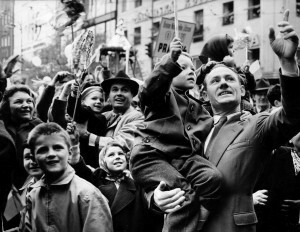 The crowd photo depicts May Day in 1959, the last year of the Ninth-of-May Constitution and a period of heavy industrialization, while the photo of the smiling families is from 1960, just after the adoption of the socialist Constitution of Czechoslovakia. In 1960 Komunistická strana Československa, or Communist Party of Czechoslovakia, membership was in decline though the socialist government largely continued using the Party’s policies. 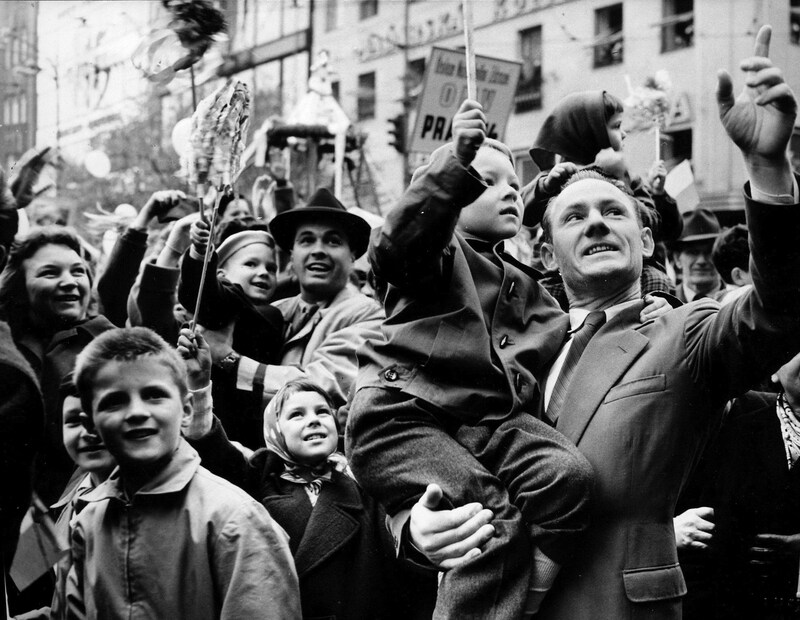 Families at May Day in Prague, Czechoslovakia; May 1, 1960; National Guardian Photographs; PHOTOS 213; Box 4; Folder 47; Tamiment Library/Robert F. Wagner Labor Archives, New York University. 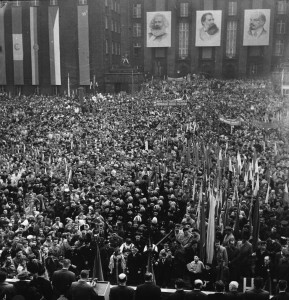 Marx, Engels, and Lenin look on in Poland May Day Crowd in Katowice, Poland; May 1, 1960; National Guardian Photographs; PHOTOS 213; Box 4; Folder 47; Tamiment Library/Robert F. Wagner Labor Archives, New York University. 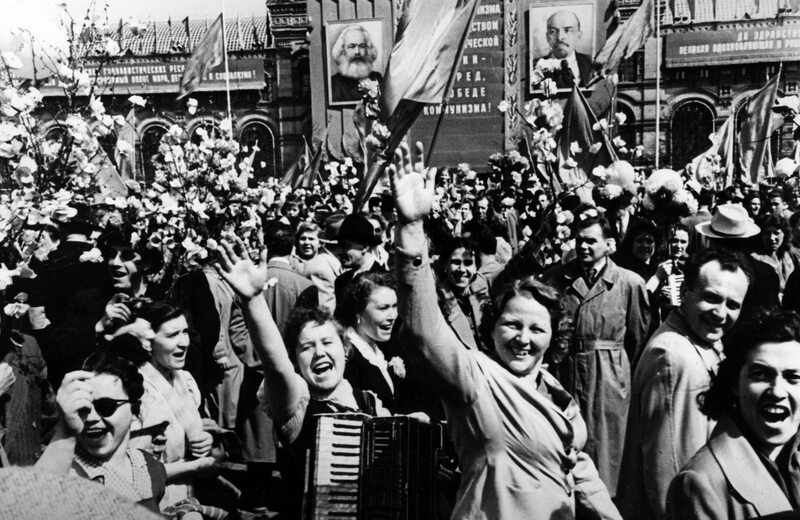 As a USSR-aligned country during the Cold War, Communist Poland celebrated May Day as a matter of course. 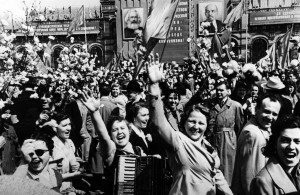 Though the state sanctioned May Day celebrations, other popular movements were constrained under the Soviet sphere of influence. 1960 marked the beginning of a decade of the tightening of Soviet reins on the country and conservative control, marked by the persecution of the Catholic Church and Polish participation in the Warsaw Pact. 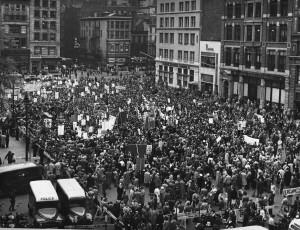 “Workers of the World Unite!” Armed Parade on May Day in East Berlin; May 1, 1959; National Guardian Photographs; PHOTOS 213; Box 4; Folder 47; Tamiment Library/Robert F. Wagner Labor Archives, New York University. 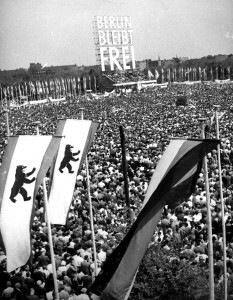 “Berlin Remains Free” May Day Demonstration in West Berlin; May 1, 1959; National Guardian Photographs; PHOTOS 213; Box 4; Folder 47; Tamiment Library/Robert F. Wagner Labor Archives, New York University. 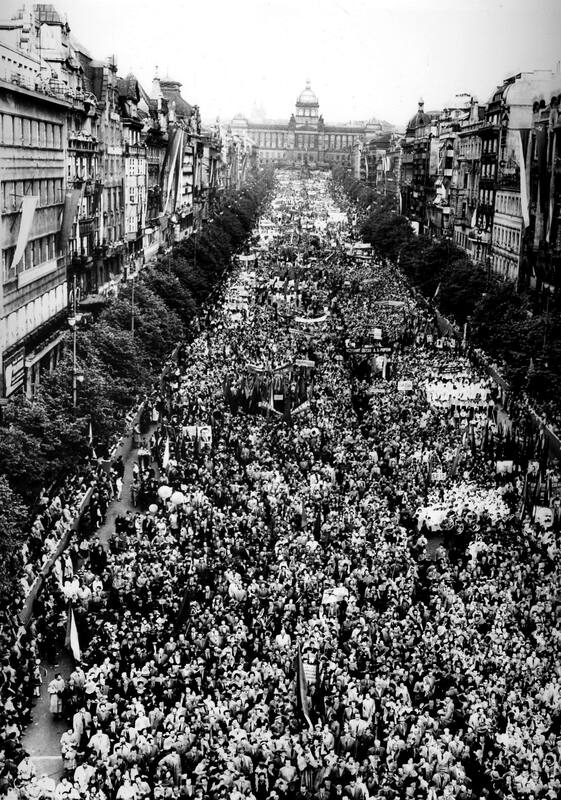 On the same day, another journalist took this photo just miles away from the East German military parade in the western part of the city. 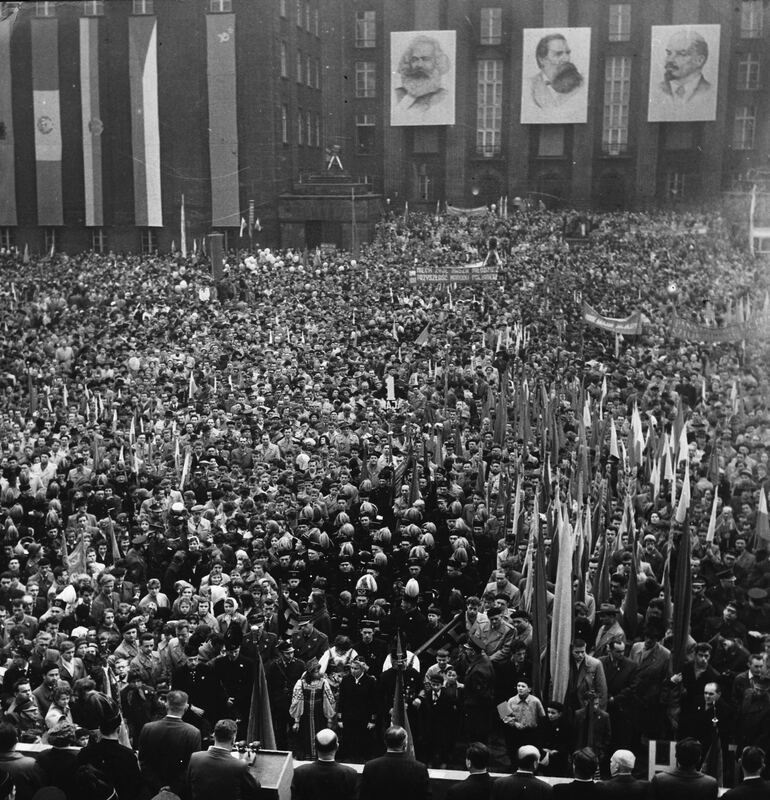 “Hundreds of thousands of West Berliners crowd into the Platz der Republik here May 1st during a May Day demonstration…A mile away in East Berlin goose-stepping Communist troops and guns of the Communist ‘People’s Army’ paraded past reviewing stands. 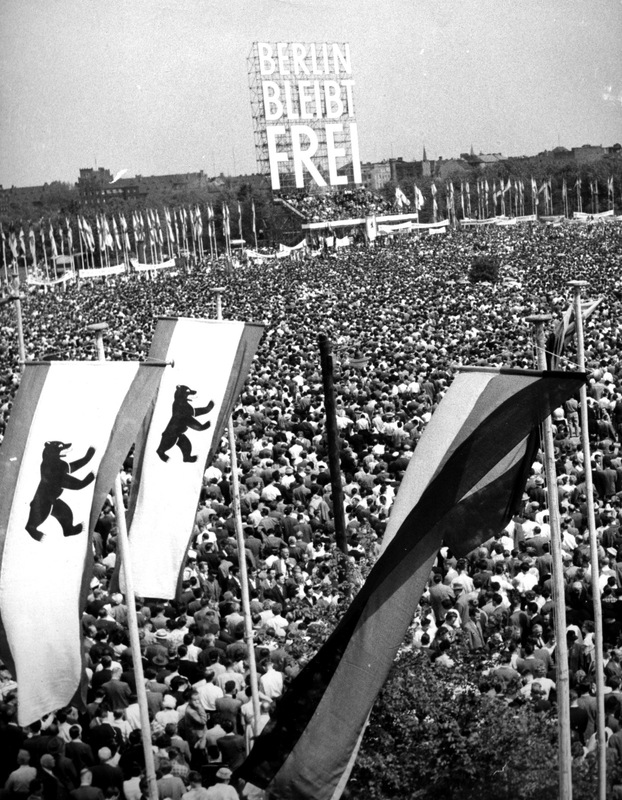 Western officials denounced the military demonstration as a flagrant violation of four-power laws banning military displays in Berlin.” The West German government was invested in propaganda that cast America as the villains in the story of German Communism. However, it is possible that popular opinion was not so polarized, especially in light of the long-time Soviet military occupation of East Germany. Though a military display was contrary to post-World War II agreements, countries in the Eastern Bloc generally held military displays on May Day in the capitals, which for East Germany happened to be in the shared city of Berlin. “End Colonialism” at May Day, New York; May 1, 1955; National Guardian Photographs; PHOTOS 213; Box 4; Folder 47; Tamiment Library/Robert F. Wagner Labor Archives, New York University. Though the United States celebrates Labor Day, a day with much the same purpose as the May Day that is celebrated globally, May 1st has been used by American leftist groups, unions, and others as a day for rallies, demonstrations, and protests. 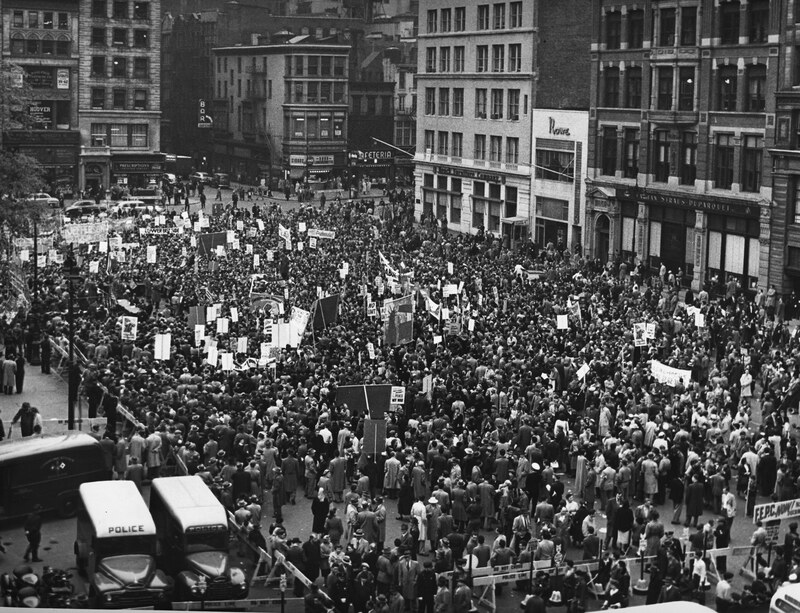 Union Square in New York is an especially popular site, with some of the largest union demonstrations occurring there during the Great Depression. 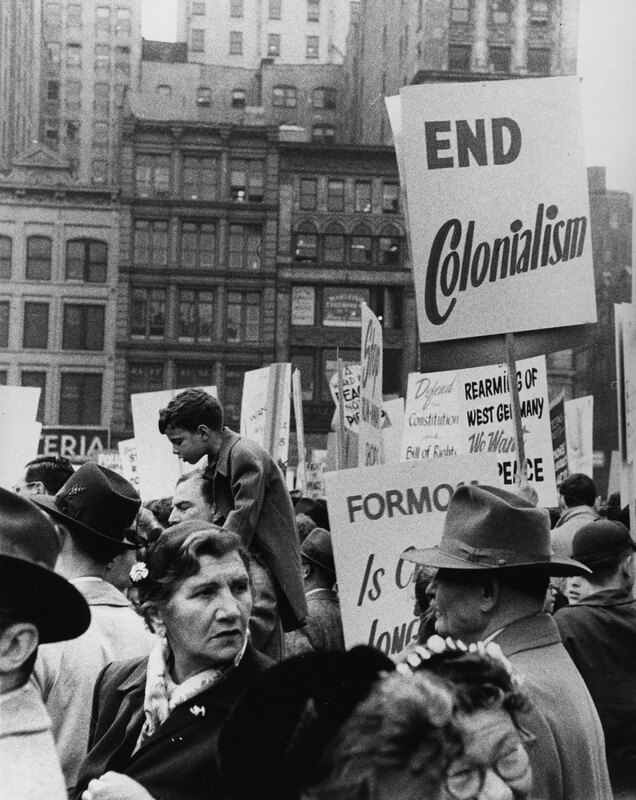 May Day in Union Square, New York; May 1, 1953; National Guardian Photographs; PHOTOS 213; Box 4; Folder 47; Tamiment Library/Robert F. Wagner Labor Archives, New York University. 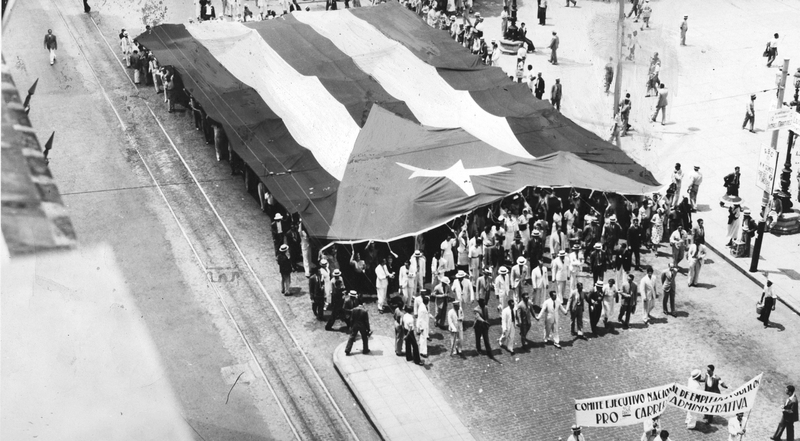 May Day Parade, Cuba; May 1, 1940; National Guardian Photographs; PHOTOS 213; Box 4; Folder 47; Tamiment Library/Robert F. Wagner Labor Archives, New York University. 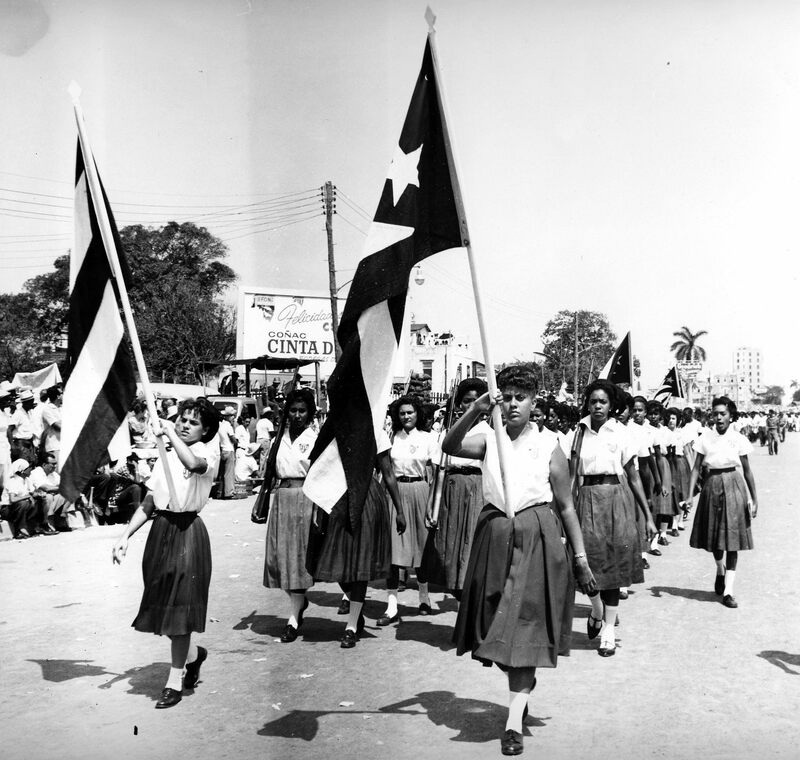 May Day is Día del Trabajo in Cuba and the day is used today to celebrate the Socialist government and and the Cuban Revolution. 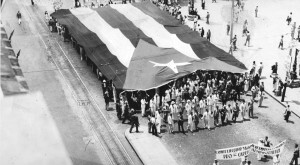 This first photo is from a Día del Trabajo celebration that was held just months before Fulgencio Batista was first elected president in 1940 after controlling Cuban politics for seven years following the 1933 uprising. 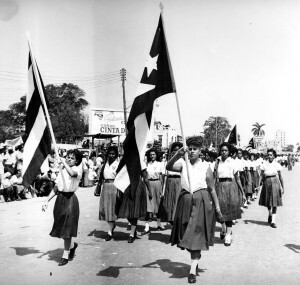 A high school girls’ militia marches on May Day, Cuba; National Guardian Photographs; PHOTOS 213; Box 4; Folder 47; Tamiment Library/Robert F. Wagner Labor Archives, New York University. May Day in Tokyo, Japan; May 1, 1946; National Guardian Photographs; PHOTOS 213; Box 4; Folder 47; Tamiment Library/Robert F. Wagner Labor Archives, New York University. 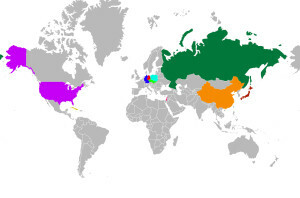 Since 1945, Japan has had a Communist party represented in the bicameral legislature. Left groups and unions often use May Day to demonstrate. This photo was taken just one year after Tokyo was subjected to one of the most destructive fire bombings in history. 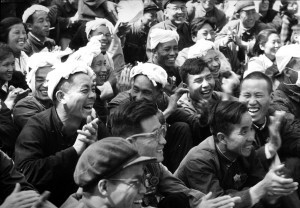 Workers laugh in the crowd on May Day in Peking (Beijing), China; May 1, 1960; National Guardian Photographs; PHOTOS 213; Box 4; Folder 47; Tamiment Library/Robert F. Wagner Labor Archives, New York University. May Day observance is mandatory in China and, before recent years, the country was given three days off to celebrate. This image shows Chinese workers laughing at a humorous anecdote from a famous singer in Beijing in 1960. This photo was taking in the midst of Chairman Mao Zedong’s “Great Leap Forward,” an initiative aimed at shifting the country’s economy from an agrarian dependency to a more industrialized workforce. The program directly contributed to the Great Chinese Famine, in which between 20 and 43 million people died. A combination of starvation, overwork, state violence, and lower birth rates resulted in a population loss of an estimated 76 million people in a three year period. 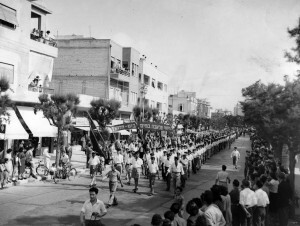 First May Day parade in Tel Aviv, Israel; May 1, 1949; National Guardian Photographs; PHOTOS 213; Box 4; Folder 47; Tamiment Library/Robert F. Wagner Labor Archives, New York University. This 1949 photo documents the first celebration of May Day in the state of Israel, as it was officially established in mid-May of the previous year. This celebration came on the heels of the Arab-Israeli war, and as of May 1st Israel had yet to sign an armistice with Syria. Four months before this photo was taken, the Mapai Party (a Hebrew acronym for “Workers’ Party of the Land of Israel”) was elected to lead the new government, along with its leader David Ben-Gurion. Happy May Day from all of us at the Tamiment!